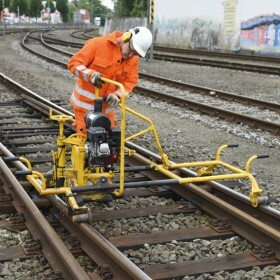 Rail network operators use Vossloh‘s Asset Management to reduce their rail and turnout costs. Our Asset Managers ensure compliance with all requirements and industry specifications in order to achieve the longest possible service life for these infrastructural components. Operations account for almost two thirds of total costs, and this is where our Asset Management comes into play. 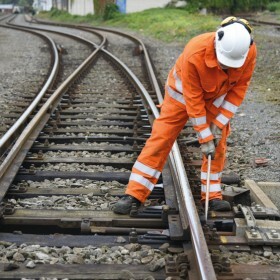 We develop a range of strategies for reducing rail infrastructure life cycle costs. Here our full service includes everything from measurements and inspections all the way to repairs, component replacement or even the complete installation of new turnouts. As an example, we would be happy to show you our Vignole-rail standard turnout concept. Straightening point blades Correcting longitudinal and transverse height discrepancies Straightening derailment damage. Measuring gauge, flangeway gap and guiding distances Measuring gauge face clearances Measuring transverse and longitudinal heights Determining switch and crossing geometries Measuring clearances on closing and drive mechanics Determining switching forces Profile measurements, UT, ET. Rail joint welds Resurfacing using welding Using welds to repair damaged areas Welding on guard rails and points blades. 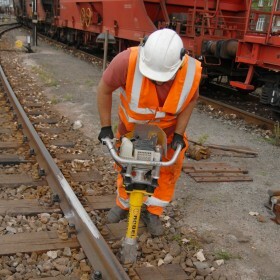 Re-profiling point blades and transverse profiles of rails Removing burrs and laps Using grinding to repair damaged areas and frogs Grinding out corrugations. 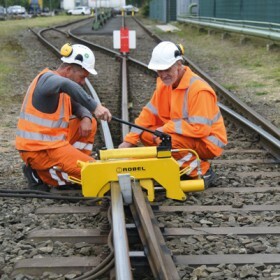 Correcting gauge, flangeway gap and guiding distances Reestablishing gauge face clearances Attending to track fastenings Replacing large turnout parts Performing tamping work Cleaning. Rails and turnouts - whether Vignole or grooved - are susceptible to the ravages of time. Our preventive maintenance strategy emphasizes the use of matching components in the planning phase. With our condition-based maintenance strategy, regular inspections aid in selecting the right maintenance procedures. Vossloh will of course also take care of eventual repairs, the replacement of individual components or installation of new rails and turnouts. 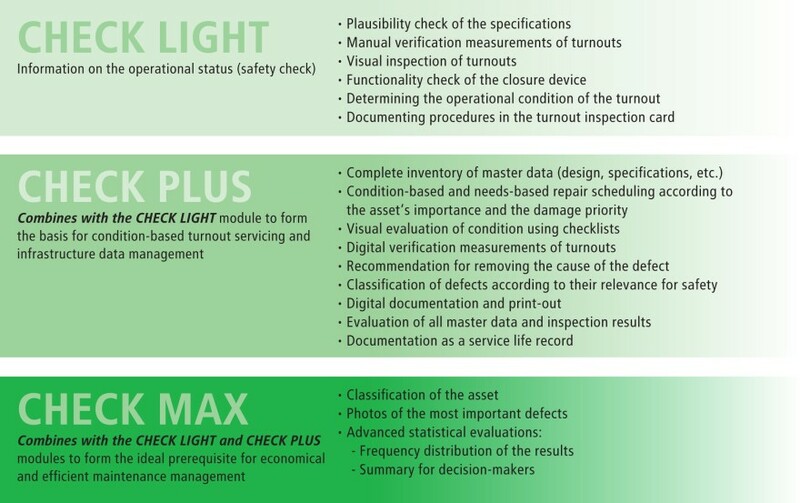 At Vossloh, Asset Management is based on clear cost objectives and clear agreements on asset quality. 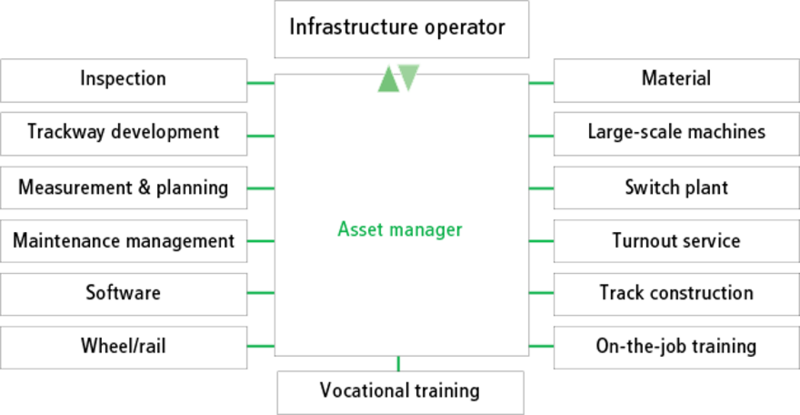 The modular structure of Vossloh‘s Asset Management comprises everything from determining requirements, preparing tenders, order monitoring and documentation to maintenance and complete management of the asset with full budget responsiblity. Thanks to the experience we have gained over the years, we can also offer a range of additional services such as the „Temporary Asset Manager“, for example. Turnouts are the most sophisticated element in a track system and the maintenance they require is also more complex. 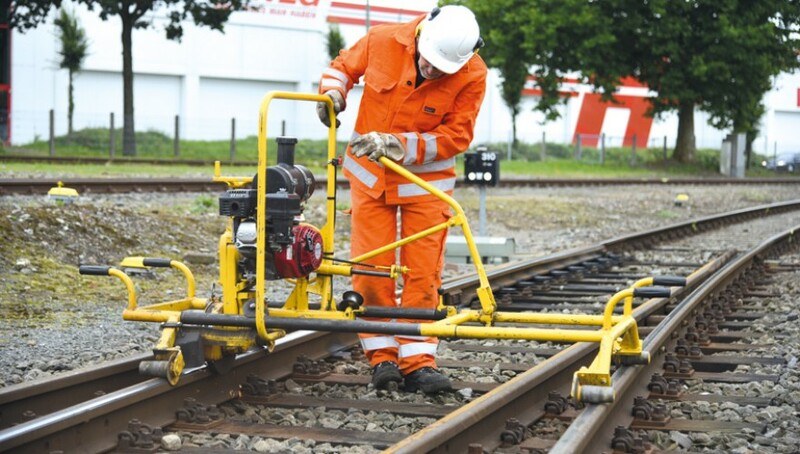 Due to their interfacing with control systems, signaling systems, grinding procedures, welding processes, electrical engineering, track construction and switching technology, turnouts generate costs many times that of rails. Fast and local: Our specialist turnout teams and expansive service network ensure that we are close to our customers and at their service around the clock, if required. Our wide range of replacement parts means that we are also equipped for any situation.